Andrew "Andy" Stewart was born in Glasgow in 1933 the son of a school teacher. The family lived in Shieldhall, Glasgow until he was 5 then they relocated to Perth before settling in Arbroath six years later. He grew up in a musical family and played mouth organ although he preferred to use his natural vocal dexterity to impersonate other instruments rather than learning to play them. He was a natural mimic and amazed his parents with impersonations of famous singers and actors. Andy attended Arbroath High School and wrote his first lyric at the age of 14. The song “My Hameland" was recorded much later in 1969 and became the title track of one of his most popular albums. 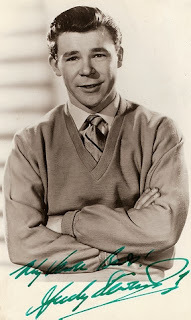 After leaving school Andy trained as an actor at the Royal Scottish Academy of Music and Drama in Glasgow and started on the boards in 1954 as a comedy impressionist. One of his most popular routines was to perform “Ye Cannae Shove yer Granny Aff a Bus’ in the voices of American stars like Jolson or Armstrong. Andy revelled in the audiences’ reaction to his impressions of Presley and Little Richard. In 1955 Andy joined the cast of a new comedy series on the Scottish Home Service called Jim & Mary (17 Sauchie Street) it drew large audiences and ran from 1955-1959. He was also master of ceremonies to the first packaged Rock & Roll show to tour England, introducing the likes of Tony Crombie and his Rockets, Don Fox and Maxine Daniels to the music-hungry teens. Steward became a firm favourite with older audiences too and appeared regularly in variety shows and pantomime throughout Scotland. In 1957 he became the host of BBC TV’s The White Heather Club which started as annual New Year's Eve party (1957–1968) before becoming a weekly series (1960–1968). At the height of its popularity, the show had a viewership of 10 million. Andy affectionately known as the ‘Hobbit,” was the master of ceremonies and sang songs and told jokes. In 1959 he signed his first recording contract with Top Rank and they released “Donald, Where's Your Troosers?” This gave Andy his first taste of chart success because it was a minor hit in the UK charts peaking at number 37. Next EMI released “A Scottish Soldier” on the Top Rank label. The lyrics were written by Andy and the song was based on an old pipe-tune called “The Green Hills of Tyrol.” The song was recorded at Abbey Road, London and accompanied by The Michael Sammes Singers with Orchestra conducted by Bernard Ebbinghouse. The recording was produced by Walter J. (Wally) Ridley. "A Scottish Soldier" spent 36 weeks in the UK Singles Chart in 1961 and was in the top 50 in the USA for over a year. In Australia the record became the biggest selling single since Bill Haley's Rock Around the Clock in 1956. Whilst his records continued to sell he never was able to repeat the earlier chart success. As an entertainer he frequently and successfully toured Canada, the USA, Australia and New Zealand. Recurrent ill-health took its toll and from 1973 onwards Andy was frequently hospitalised. He continued to work when he could but sadly the "The Tartan trooper, " Andy Stewart died in 1993.